1) I've been coveting R.J. Graziano jewelry for years, and this was my first acquisition. 2) Lucite is the season's biggest jewelry trend, and I was ecstatic to finally get my hands on a stunning, original piece. 3) The oversized clear bubbles reminded me of marbles -- and, while I was never good at playing with marbles as a kid, it did bring me right back to my childhood. This necklace WILL get you noticed. Every time I slip it around my neck, I get compliments all day long. From strangers on the street to coworkers to friends, people can't get enough! And I'll let you in on a little secret -- I can't, either. 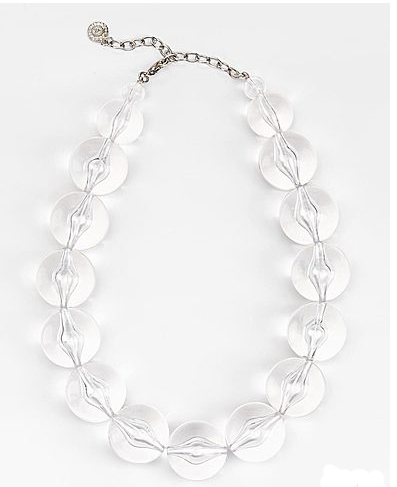 The R.J. Graziano Clear Lucite Bubble Necklace retails for $75. I love your R.J. Graziano Clear Lucite Bubble necklace. Right after this post I will venture over to his site.